Airlan is a new generation wireless telecommunications carrier and broadband internet service provider (ISP) rolling out a broadband network using carrier-grade high-speed wireless equipment in regional areas of Australia. Airlan is delivering broadband Internet services to residential, business, hotels, motels, lodges, cafes and multi apartment buildings and resorts. 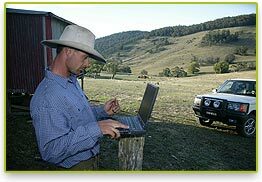 The service is delivered through point-to-multipoint, point to point fixed wireless and roaming Hotspot infrastructure operating in the 2.4Ghz and 5.8Ghz spectrum, which is regulated for Class License use by the Australian Communications Authority. There has been widespread proliferation of wireless local LAN technologies in recent years. In particular corporate wireless LAN as well as public hotspots are now providing wireless LAN services within the confines of office buildings, hotels and cafes. With its proprietary RF design techniques, Airlan is leveraging the enormous investment in 802.11 based technologies, and extending it to provide a much larger wide-area network coverage in the Snowy Mountains area. Airlan's wireless network provides an alternative, lower monthly cost and superior broadband service to conventional wired ADSL and dial-up systems. Airlan's wireless network also provides a flexible system where the same account can be used anywhere in the coverage areas. There is no need to have a phone line for broadband internet connection. Airlan delivers a unique combination of carrier grade reliability and small service provider flexibility to the small to medium sized business and residential markets in regional areas of Australia. Airlan's coverage currently includes Jindabyne, Kalkite, East Jindabyne, Berridale, Cooma, Perisher Valley, Thredbo, Lakewood, Abington Park and now in Merimbula. Our coverage will extend in the south coast to Pambula beach, Tathra, Narooma, Eden, Bega, Tura beach, Tuross Head, Potato Point and Batemans Bay in 2009. With staff experienced in Global organisations like Westpac, Vodafone, MLC/NAB, CommBank, Cisco Systems, Electronic Data Systems (Australia), and IBM you can rest assured that there is plenty of talent and depth of knowledge to draw on in all aspects of Information Technologies and design.